Over 120 works by famous pop artist Andy Warhol are now on display in Taipei as first leg of the Andy Warhol World Exhibition! 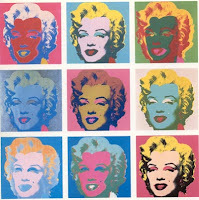 Four of Warhol's most well-known series -- Marilyn Monroe, Chairman Mao, Cow, and Flower -- are also among the exhibits. The exhibition opened on January 1 and will run through March 29 at the first display room of Chiang Kai-shek Memorial Hall in Taipei.